RAAF Virtual is a volunteer run group comprised of civilian, active duty, and overseas (worldwide) participants. We fly flight operations in Australia, New Zealand and all over the world. This organisation mirrors our real world counterpart, and pays homage to the men and women who serve with the Australian Defence Force. RAAFvirtual undertakes a variety of missions on the VATSIM network including Tactical and Strategic Strike, Air Superiority, Airborne Early Warning & Control, Maritime Patrol and Surveillance, Reconnaissance, Flight Test and Evaluation, Special Operations, Humanitarian airlift and other substantial core and support missions. We continually strive for realistic, educational yet fun operations on a day to day basis. RAAFvirtual operates a modern fleet of aircraft. RAAFvirtual is committed to fleet modernization, the test, evaluation, and practical application of new technologies to achieve greater realism than ever before. We continue to seek quality team members to help lead us through our growing role in the VATSIM Special Operations community. 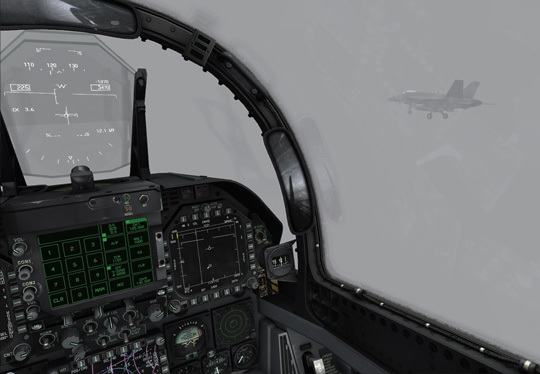 Do you like flying fast military jets within a realistic environment? Then the Fast Jet stream may be the path for you. We offer a large range of courses in the F/A-18 Hornets and soon F35's! Does the cargo, tactical or Long transport stream of the RAAF interest you? The Heavy Stream may be the way for you! We offer courses in various aircraft which are used for these purposes in the real RAAF! Fly with us today to experience the best training offered in the virtual world of military simulation! We are willing to accept all applicants 16 Years and over whom are located in a timezone that can participate with our group (Australian Timezones are +10 - +13UTC) and depending on circumstances we can be flexable on even that requirement. Why do you want to join RAAFvirtual? Am I registered on VATSIM? Do I have my own copy of P3D? Can my computer system run it adequately? The following equipment is absolutely essential for online flight operations do I have it? Are you willing/prepared to install third party software that runs alongside Prepar3D? as RAAF Virtual uses a custom windows application for the filing of our pilot reports and other systems called S.C.I (Simulation Control Interface) ATOMS 2.0. You may also be required to purchase payware aircraft for some airframe types. Please note that RAAFvirtual is NOT responsible for any harm that third party software may cause to computers and that technical support for third party products should be sought directly from the authors. RAAFvirtual does not provide extensive technical support for third party software packages whatsoever other than SCI/ATOMS. SCI/ATOMS (Supplied by us), FSInn or Vpilot and Teamspeak Client is compulsory third party software and must be installed and working correctly. If your still interested in becoming a member then: CLICK HERE TO FILL OUT THE REGISTRATION FORM. For any enquiries please do not hesitate to contact us! The Australian Federal Government, Department of Defence and the Royal Australian Air Force do not endorse or support this organisation. RAAFvirtual is a Non-Profit group, run by volunteers, and is comprised of members who share a common interest in the simulation of military operations and procedures through the use of Microsoft Flight Simulator and other third party software. Information presented on this website remains the property of RAAFvirtual. Some images on this website have been generated by RAAFvirtual, and therefore remain the property of RAAFvitual. This website, and the contents thereof, is under copyright by RAAFvirtual, and all rights are reserved. Information on this website in no way represents any opinion or policy of the Royal Australian Air Force. Information and graphics on aircraft have been obtained from declassified sources available online. RAAFvirtual will not tolerate members that share commercial files (pirated copies of payware) and breaching Copyright laws. Content generated by RAAFvirtual staff and members remains the property of RAAFvirtual. Members who share documents, text, images, scenery files, aircraft repaints etc with people who are not members, will be removed from the organisation, and the person reported to the appropriate authorities for investigation. Legal action will occur against any person or organisation, if this website and its contents is replicated, copied or redistributed in any way.